Look for a window when everyone's occupied and make a mad dash for the fitness center. Plan to park yourself by the palmy pool as soon as the sun's high enough. Grab a table and glass of wine, and bask in the warmth of the tropical climate. Or try your hand at pool - whichever table's open. Movie night awaits - get ready for it. Golfer? You can be at the Fort Buchanan course in 14 minutes flat. Its modern, urban aesthetic and easy access to San Juan sights make Hyatt House San Juan a smart stay for those who have wheels, will travel. You’re minutes from spectacular beaches, gorgeous golf courses, the lively Condado district, peaceful San Juan Central Park and historic landmarks like the narrow streets of Old San Juan. Get your day off to the right start with the free continental breakfast; it features a made-to-order omelet bar and grab-n-go options aplenty. Spend the day lounging by the outdoor pool getting your tan on while the kids show off their diving skills. When it’s time for lunch, keep it casual with poolside snacks and sandwiches from the on-site convenience store. The 24-hour fitness center caters to your schedule (or blissful lack thereof) with anytime access. Spacious studio and one-bedroom condos sleep four guests, are air-conditioned and overlook the Atlantic and San Juan Bay while giving you plenty of room for your kid-gear and inflatable pool rafts. Studios have kitchenettes allowing you to prepare basic meals. One-bedroom condos have full kitchens where you can whip up anything from macaroni and cheese to a four-course meal. Declare it top-your-own pizza night and let the kids go wild. Don’t worry if things get crazy; there’s an on-site laundry facility. Flatscreen TVs with cable provide in-suite entertainment. Gather the kids on the couch and channel surf through the options. Good news! Hyatt House is a dog-friendly resort, so your four-legged family member doesn’t have to miss out on all of the vacation fun. But wait, there’s more. The resort offers daily housekeeping, so you’re off the hook in that department. If you’re up for venturing out, give the kids a tour through the sixteenth century World Heritage Site, El Morro Fort on San Juan Harbor (shh, don’t spill the beans that it’s educational). Or spend the day at nearby Condado Beach, checking out the boutiques and eateries – plus there’s free live music at La Ventana al Mar (Window to the Sea) outdoor park if you hit it on the right day. Ready to test your luck? Check out Casino del Mar, located in the lobby of La Concha Beach Resort. It features over four-hundred slot machines and twenty-four table games. If you feel like a game of golf, visit the Fort Buchanan Golf Course. This nine-hole course was built in 1949 and has professional golfer Jerry Hesby available on-site. Additional taxes apply to daily parking rates at this property. For more details, please contact the office using the information on the reservation confirmation received after booking. 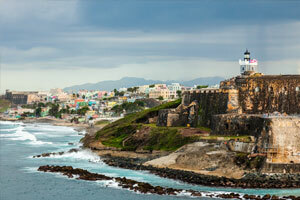 San Juan offers something for everyone, combining the excitement of visiting a big city with the calm of a tropical island. Experience fine dining, high-end shopping and an exciting nightlife. Miles of golden-sand beaches provide endless opportunities for relaxation.